When Can I Get My Incision Wet? Surgical incisions are usually kept dry in the immediate days following surgery. But you may be anxious to shower, swim, or get your incision wet. Each doctor varies in particular recommendations, but here are some general guidelines for when an incision can get wet. As mentioned, each doctor treats incisions their own way, so always check with your doctor if it's OK to get your incision wet! There is little scientific evidence to support the claim that a wet incision will get infected, but many doctors have this concern. These recommendations have a limited scientific basis. There are only a handful of studies that have been performed to ask this question and must demonstrate that there is no difference between patients who shower soon after surgery (including getting the actual incision wet) and those who wait to shower. However, there may be real concerns about getting an incision wet too soon. Therefore, always check with your doctor before getting your incision wet. There are sometimes specific reasons or concerns that may not be relevant to other patients, but may be important in your particular situation. When you are permitted to wash your incision, you should use a mild soap, and never scrub an incision. Be gentle on the skin surrounding the incision, and allow any scabbing to fall off without pulling at loose skin and scabs. Toon CD, Sinha S, Davidson BR, Gurusamy KS. "Early versus delayed post-operative bathing or showering to prevent wound complications" Cochrane Database Syst Rev. 2015 Jul 23;(7). Carragee EJ, Vittum DW "Wound care after posterior spinal surgery. Does early bathing affect the rate of wound complications?" Spine. 1996 Sep 15;21(18):2160-2. Should You Have Metal Implants Removed After Surgery? 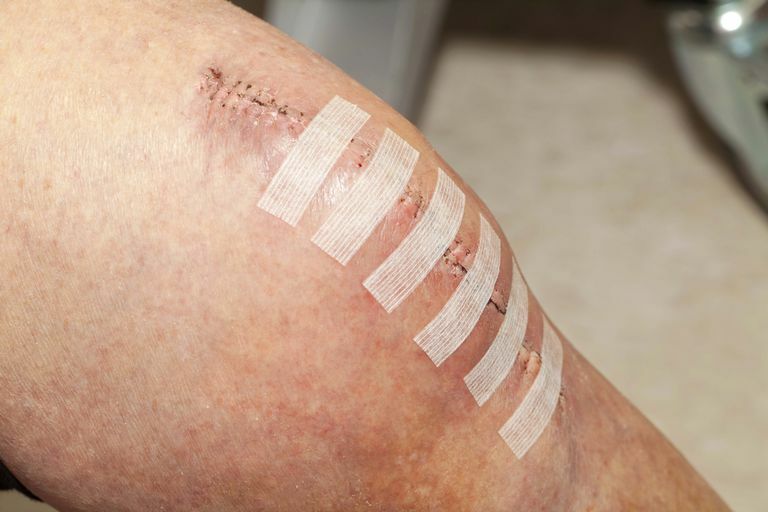 Should Skin Be Numb Around Your Knee Replacement Incision? Do You Need Surgery for a Torn Achilles Tendon?